Really Nice Wine Glasses for $2.35 a Stem? 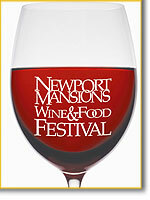 The 7th Annual Newport Mansions Food & Wine Festival is coming the weekend of September 21 - 23, 2012. Set in the spectacular Newport Mansions on the Atlantic Ocean, this is an event to check out. One of the highlights of the weekend is the Grand Tasting on the lawn of Marble House. Great wines, fabulous food from more than two dozen restaurants and food exhibitors, free cooking demonstrations by celebrity chefs like Emeril Lagasse, and ocean views are included in your ticket price. The event organizers have given me 2 tickets for the Sunday Grand Tasting to give away here on this blog. At a face value of $110 per ticket -- $220 total -- this is a nice opportunity. To enter, leave a comment on this blog post (http://www.wellesleywinepress.com/2012/08/giveaway-newport-mansions-food-wine.html if you're reading this in a feed reader or via email). If you'd rather keep your entry on the down low, or you're having trouble with the commenting system, drop me an email with your entry: wellesleywinepress@gmail.com Winner will be picked by random drawing on Friday, August 31st 2012. We received 34 entries for the 2012 Boston Wine Expo giveaway. Let's see if we can top that. For a complete listing of events, and to purchase tickets visit the Newport Mansions website. And follow @NMWineFood on Twitter for more information.